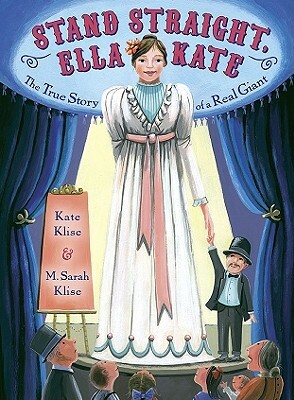 Stand Straight, Ella Kate: The True Story of a Real Giant by Kate Klise and M. Sarah Klise. (Grades 1-5.) Dial, April 2010. Unpaged. Review copy provided by my local library. This title has been nominated for the Cybils Award and this review reflects only my own opinion, not necessarily the opinion of the panel. Chances are, you're close to average. Ella Kate Ewing was not average. Born in 1872, Ella Kate was a typical little baby. She didn't stay that way. By the time Ella Kate was thirteen years old, she was almost 6 feet tall. People stared at her, pointed at her, and called her a freak as Ella hunched over to make herself look smaller. Her mother told her, "Stand straight, Ella Kate!" In time, that's just what Ella Kate learned to do. At age 18 and over 8 feet tall, Ella Kate was hired by a Chicago museum and paid $1,000.00 (a LOT of money back then!) to stand in an exhibit and let people look at her. Eventually, she moved on to other similar jobs at museums, circuses, and even a world's fair. Ella Kate's large size was the ticket to her freedom. While most women stayed at home, Ella Kate was able to be independent, earning her own money, and traveling to see the world! This is just the sort of book I love - an accessible biography about someone who's little known and interesting! The first-person narration makes Ella Kate's story accessible to kids. It reads like Ella Kate is sitting down and telling the reader all about her life. Ms. Klise includes many interesting anecdotes about Ella Kate's life. The illustrations complement the text very well and I loved finding little details throughout that add much to the story. Ella Kate speaks about how her mother couldn't make dresses fast enough, so she just sewed extra fabric on to the hems and you can see in several pictures Ella wearing dresses or pants with extra fabric sewn around the bottom. In a spread showing an Independence Day celebration in 1885, the 38-star flags are proudly hanging (yup, I counted). OH and the endpapers!! The endpapers are illustrated with drawings of some of the things in Ella's life, like her glove and her show (both shown actual size), her custom-made bed (9'6" long), her bathtub (6' long). Don't miss showing kids the endpapers! Read more reviews at Madigan Reads, NC Teacher Stuff, Cover to Cover Kids, and The Fourth Musketeer. Stand Straight, Ella Kate is on shelves now! Happy Nonfiction Monday! Head on over to Capstone Connect for the roundup!